In the wake of the killing of 16 puppies at the state-run NRS Medical College Hospital on Sunday, Union Minister for Women and Child Development Maneka Gandhi has asked the hospital authorities to suspend the nursing students involved in the brutal killings. 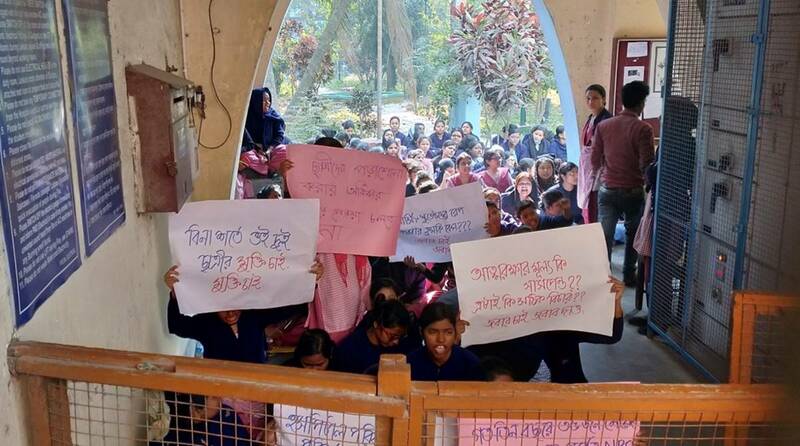 Gandhi, who is a well known animal rights and environment activist, called up Dr Dwaipayan Biswas, deputy superintendent of the hospital, on Thursday and threatened to cancel the licence of the nursing college inside the NRS premises if the authorities did not take strong action against the nurses. It is learnt that she has already taken up the matter with the Nursing Council of India in Delhi. The three-member inquiry committee probing the incident had submitted its report to the hospital. The report held three students guilty of killing 16 puppies and torturing their mother. On the other hand, nurses along with students of the hospital turned violent this evening demanding the NRS Hospital be made a dog-free zone. The agitating nurses also demanded immediate release of the two students who are in police custody. They held a meeting with the hospital superintendent Dr Sourav Chatterjee and Dr Biswas. But the meeting ended without any resolution after the authorities refused to meet their demands. The nurses gheraoed the superintendent, deputy superintendent and nursing superintendent of the hospital and staged a demonstration. Police rushed to the spot to rescue the officials. The agitators chased the officials as police escorted them to their vehicles.The nurses were seen hitting the police vehicle in which the officials were being driven out of the hospital. The nursing superintendent, meanwhile, managed to shelter inside a hospital quarter. The 16 dead puppies found in plastic bags in front of the nurses and nursing students’ hostel inside the state-run NRS Medical College and Hospital compound had given a shock to animal lovers in the city. accommodate the dogs,” said Mayor Firhad Hakim. He added that complaints had been pouring in concerning dog bites and also roads becoming dirty with dog waste. “The state government is going to help the KMC in carrying out the initiative. A total of Rs 3 crores will be disbursed from the state funds for the same. The detailed project report has already been prepared for the initiative and the temporary structure will be completed in the next two months. We will perform 1000 operations per day for which we will appoint veterinary doctors on contract basis. The health department has been instructed to look after the matter. The dogs will be picked up, sterilised, and then released back where they were picked up from,” said Mr Hakim. Instructions have also been given to the conservancy department and workers will be appointed for cleaning of dog waste from the streets. The roads are becoming increasingly dirty and complaints are pouring in from residents of several areas, said the mayor.